A little while ago The Camera Store started stocking a new, old product, called Sunprints. There are two varieties, one comes with an acrylic sheet, necessary to squish things down and keep still on the paper, and the other variety comes without the acrylic, both are available in two-sizes. Sunprints are too much fun, and super easy to use. You will need: the sun (duh), some water in a bath, and a subject to squish (preferably not squirmy… but you decide). We’re pretty excited by these things, so on a recent fall day, with summer fading into fall, and falling into winter, I went out to make some with a few other Camera Store folk, Rosanna (pictured), and Jill (who took boss pictures). The process is pretty basic, you find something you want to make a print of, you mash it on to the paper with the acrylic, you wait around for five minutes, then you dunk the paper into water to fix the image, and then you dry your print. The result is a blue and white, eerily beautiful outline of whatever you decided to make as your subject. 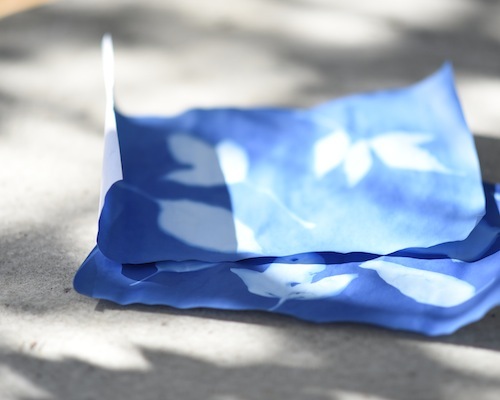 There are a number of entertaining side applications too, like making Sunprint origami, making prints from transparencies, or even loading the paper into pinhole type cameras.